In the last post, we saw how to extract values from the Future upon onComplete and their counterparts - onSuccess and onFailure. We also saw how to use Await.result in Testcases to block and get the value from Future. In this post, we'll discuss briefly about the relationship between a Promise and a Future. The concepts Promise and a Future go hand in hand. A scala.concurrent.Promise is the one which sets a value for the Future. In other words, the Promise is the brain behind executing the computation asynchronously and Future is just a handle for reading the result when it becomes available. Crudely put, the Promise is the setter and the Future is the getter. Most often, we won't need to explicitly create a Promise. However, we are required to understand what a Promise is, in order to truly understand how a Future works. Let's use the following examples to understand how to create a Promise. In the following piece of code, we will see how a value is set in a promise and how it is read on the other side. There is no time consuming process happening behind the scenes. The value is set to the Promise immediately and therefore the value is immediately available via the Future. When we run the Testcase code, the onComplete callback gets called immediately after the promise.success(100) is called. Now that we saw how to complete a Promise by setting a successful value or an exception, we'll see how to execute a block of code asynchronously. In the following Testcase, we pass a block of code to the someExternalDelayedCalculation to be executed asynchronously. Let's look at the testcase first. We pass a block as argument. The block of code simply sleeps for 2 seconds and then returns a 100. Assert the value after 3 seconds. 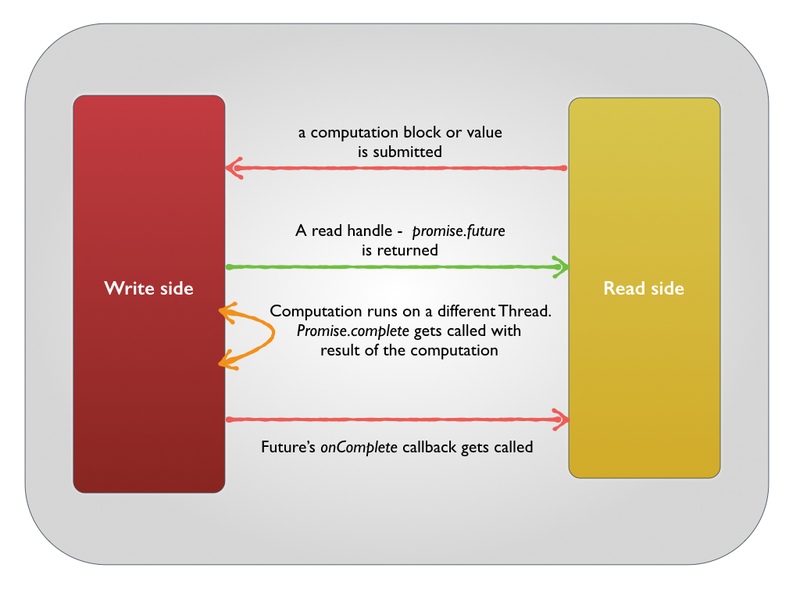 create a FixedThreadPool to execute our asynchronous code. execute the Runnable in the somePool threadpool. return the promise.future from which the caller can read the value. 3. How is the Future.apply() actually implemented? Well, I cheated. The code in bullet 2 is actually stolen from the actual implementation of the Future.apply itself. Remember in the previous post, we saw that when a block of code is passed into the Future's apply function, it gets executed asynchronously. Now, compare the code above in someExternalDelayedCalculation with the actual implementation of Future.apply and the Runnable that it wraps. returns the promise.future from which the caller can read the value. Once the promise gets completed either with a Success or a Failure, all we could do after that is to extract the value from its Future. Also, the onComplete callback of the Future gets called. The value wrapped inside the Future of the Promise is set in stone and cannot be changed. If we attempt to set a new value by completing an already completed Promise, an IllegalStateException is thrown. Let's look at this using a snippet. In the following code, we create a Promise and complete it with a value of 100. We then attempt to complete it with a failure. The testcase just asserts that the IllegalStateException gets thrown when an attempt to complete the Promise with a Failure.